Dorm Co. Tip: Dorm rugs are necessities for dorm rooms. A bold design with neutral colors can take a bland dorm room and turn it into a haven of sophistication and comfort. 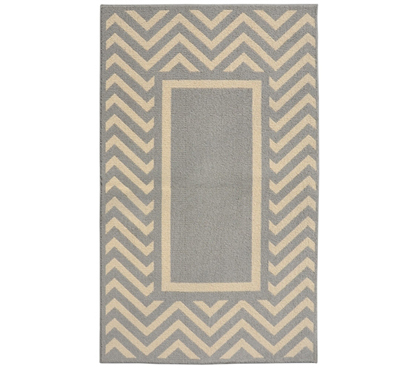 Take the Chevron Frame College Rug in Silver and Ivory for example. 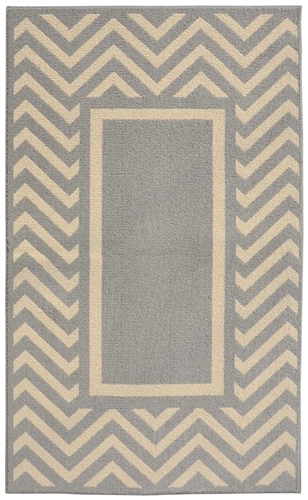 With neutral colors, this college area rug is sure to match your other dorm decorations and college supplies, while also bringing fun design elements to your overall dorm decor. In a 5' x 7' this dorm carpet will be large enough to cover the central area of your dorm room, and will give you plenty of comfortable space to work with. Made of Polypropylene, it will hold up from one year to the next, even if you are playing endless games of twister and picnics on your dorm carpet are a weekly occurrence. Never had a dorm picnic? Well grab your Ramen Noodles and pizza and sit on down!